FLORIDA: "Unprecedented" Michael To Make Landfall At Category 4, Gov Says It's Too Late To Leave [VIDEO] - Joe.My.God. Michael roared down on the Florida Panhandle strengthening into a Category 4 hurricane early Wednesday before it crashes against the region’s white-sand beaches, fishing villages and coastal communities later in the day. The unexpected brute that quickly sprang from a weekend tropical depression grew swiftly, rising in days to a catastrophic storm. Around midday it was expected to become one of the Panhandle’s worst hurricanes in memory with heavy rainfall expected along the northeastern Gulf Coast and life-threatening storm surge of up to 13 feet (4 meters). Florida officials said roughly 375,000 people up and down the Gulf Coast had been urged or ordered to evacuate. Evacuations spanned 22 counties from the Florida Panhandle into north central Florida. But fears lingered that some failed to heed the calls to get out of Michael’s way as the hard-charging storm began speeding north over the warm waters of the Gulf of Mexico. 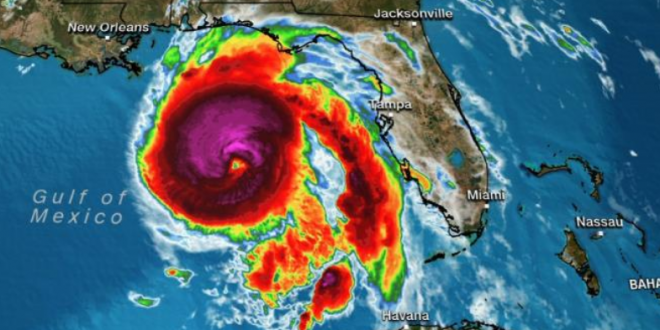 If Michael makes landfall as a Category 4 storm, as expected, it will be the strongest hurricane to ever come ashore along the Florida Panhandle in records dating to 1851, according to Dr. Phil Klotzbach, tropical scientist at Colorado State University. In fact, Florida’s entire Gulf Coast north of Punta Gorda has never recorded a Category 4-plus hurricane landfall. Most all customers will lose power, with major tree damage and structural damage along the path of Michael near and just inland from where it makes landfall on the Florida Panhandle and southwest Georgia. These power outages may last over a week in some of these areas. Widespread power outages may extend into parts of the rest of south and east Georgia, southeastern Alabama, the low country of South Carolina and southeast North Carolina given Michael’s faster movement.